Product prices and availability are accurate as of 2019-04-21 15:54:07 EDT and are subject to change. Any price and availability information displayed on http://www.amazon.com/ at the time of purchase will apply to the purchase of this product. 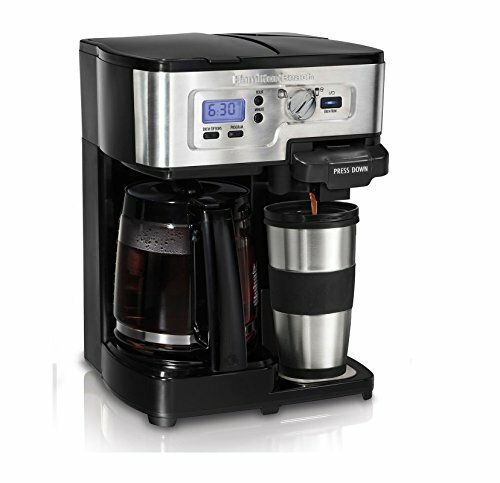 Hamilton Beach Coffee Maker FlexBrew. 2 way FlexBrew coffee maker- Brew a whole pot (12 cup) or make a single cup, Use ground coffee and choose regular or bold strength, Programmable timer with automatic 2 hour shutoff, Pause and Serve- Automatically pauses brewing when the pot is lifted off the base. Single cup- Brews up to 14oz in a travel mug or adjust to fit a shorter cup, Uses a K Cup or your own ground coffee (reusable K Cup filter included). Bonus Stainless Steel Travel Mug and Permanent Gold Tone Filter Included.